Natural Dog Care set includes a Natural Dog shampoo bar 90g, with Natural timber soap holder and 20ml Natural Flea Treatment Concentrate. 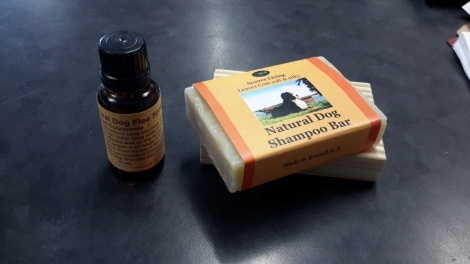 Dog Shampoo repels fleas, leaves dogs coat soft & silky, and soothes dry itchy skin. Natural Flea Treatment concentrate can be made up into 250ml spray bottle for use on dogs coat, carpets and bedding during flea season.